Investors appear to have one main thought this week: Put money in steady, stable companies. The Dow finished higher again today while the S&P 500 and Nasdaq flipped negative after teetering between modest gains and losses for most of the day. 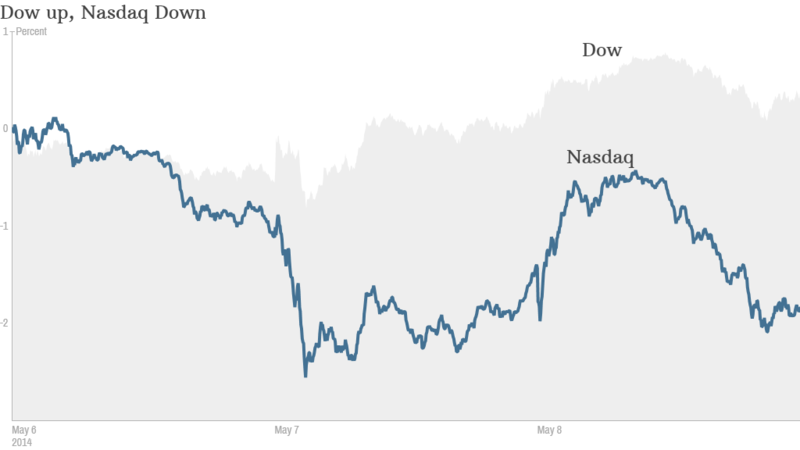 It was the second day in a row that the Dow was up and the Nasdaq was down. The Dow jumped this morning after Federal Reserve chair Janet Yellen reiterated her commitment to keep interest rates low until the economy is on firmer footing. She made her comments when appearing before the Senate Budget Committee. It was more or less an encore of her remarks yesterday to the Joint Economic Committee of Congress. There's ongiong pressure on Wall Street on so-called momentum stocks, especially tech. The Nasdaq peaked in March and has been mostly headed lower since. Shares of Tesla (TSLA) sank over 11% in volatile trading Thursday. The company's earnings beat expectations Wednesday, but Tesla forecast that expenses will continue to rise as it expands into China, develops its next vehicle and breaks ground on a new factory. "$TSLA Running out of people who can afford to buy their expensive cars," said TexanGal on StockTwits. Only so many millionaire hippies in the world." Still, StockTwits trader humble747 likes Tesla's long-term prospects. "$TSLA like company as story of fast & bright-light future growth and the story of the innovation, " she said. While Tesla CEO Elon Musk probably isn't too thrilled about the the luxury automaker's stock performance Thursday, the sun is still shining for SolarCity (SCTY), the company in which he serves as chairman. The solar panel maker surged more than 12% after it beat earnings estimates and subsequently received a series of analyst upgrades. "$SCTY, no reason to even think about selling anytime soon," said StockTwits user joshadams. "$SCTY I love buying stock in companies whose operating model and growth potential is misunderstood and undervalued," said rkmatters on StockTwits. "This is one of them." The Keurig Green Mountain (GMCR) coffee machine is on overdrive. Shares spiked 13% after the company posted double-digit sales and earnings growth for the first quarter. The company also announced the expansion of its partnership with the J.M. Smucker Company (SJM). 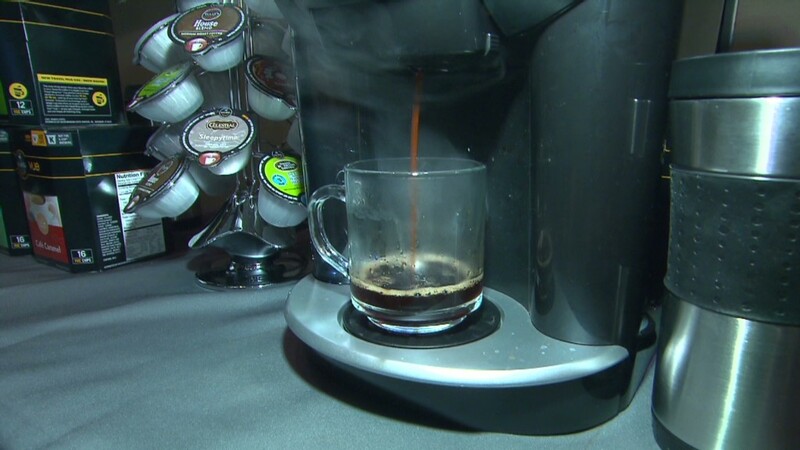 The deal makes Smucker's coffee brands such as Folgers available in Keurig products and brewing systems. Other popular stocks popping today include 21st Century Fox (FOXA), which rose 6.5% after its earnings beat analyst forecasts. The company experienced a bump in revenue from its cable network programming. It's the parent company of Fox and Sky TV. Tiffany& Co (TIF) shares had some extra glow today after the luxury retailer got a "buy" rating from Bank of America Merrill Lynch. The stock ended the day 2.5% higher. The Wall Street reception wasn't so good for Dish Network (DISH), which dropped 4%. The company reported lower profit for the first quarter and said television subscribers were added at a slower pace than the same period last year. Barclays (BCS) rose 8% London trading after the bank said it would cut 19,000 jobs over the next three years and trim its investment banking division. European markets finished higher and nearly all Asian markets closed with gains.